Hutcheson Horticultural has been doing business in the metro-Atlanta area since 1988 and continues to focus on key services that we know are important to our customers. In the next few months, we are going to spotlight some of our services through a series called “Service Spotlight”. We will be offering additional information on each service and welcome comments and questions on the blog posts! Today’s service spotlight is our Installation service. No job is too big or small! Whether it is a screen of large evergreens or a few azaleas to add color to your landscape, Hutcheson will purchase and install quality commercial grade plants for you with a warranty on our work and our product. 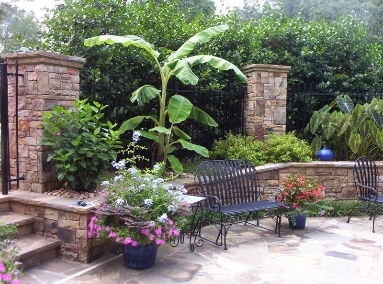 We design and install residential and commercial hardscapes that include retaining walls, water features, walkways, patios, driveways and much more. For our patios and walkways we offer a wide variety of materials including concrete, pavers and a variety of natural stone. Retaining walls may be constructed using concrete block faced with brick or stone, 6″x6″ pressure treated timbers or decorative concrete stone. Building materials are available in various colors and textures to compliment the design style of each project. Regardless of your choice in material, Hutcheson will complete the job with the highest standards of quality and workmanship. 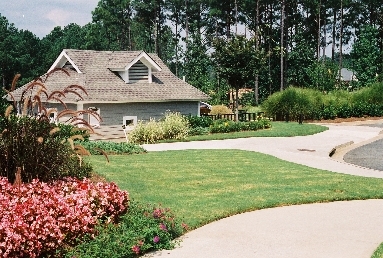 A fully functional irrigation system will help protect your landscape investment as well as conserve water. Hutcheson’s irrigation professionals are fully trained in all facets of irrigation systems – installation, maintenance, troubleshooting, and on-site repairs. Our crews and trucks are well equipped to ensure they can maintain, diagnose and repair your system quickly and efficiently.